A recent clutch of releases on from Warner Classics and Jazz sees more riches from the joint Erato and Teldec catalogues returned into circulation at credit-crunch friendly prices. Warner's anniversary Handel and Haydn editions are well under way but the first two volumes of a Mendelssohn edition, set to run to five sets of four or five CDs each, have much to recommend them, despite the sometimes rather arbitrary programming. Volume One is made up of the symphonies, the E minor Violin Concerto, the two piano concertos, the Capriccio Brilliant and a clutch of overtures. It's a shame that the powers that be decided to include Nikolaus Harnoncourt's admittedly excellent recordings of the 'Italian' and 'Scottish' Symphonies – with the Chamber Orchestra of Europe – which have also just been re-released on a single disc in the Maestro series. All the other symphonies as well as the concertos are played by Kurt Masur and Mendelssohn's own Leipzig Gewandhaus Orchestra so it's a strange decision to break up Masur's own very fine cycle. 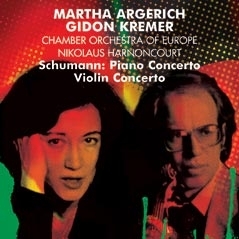 The final disc of the concertos is a real delight. Maxim Vengerov is the soloist in the Violin Concerto, turning in a beautifully played account, while Cyprien Katsaris has just the quicksilver virtuosity and mischief to make the piano concertos skip along irresistibly. 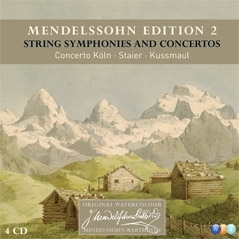 The same quality is there in spades in the second volume which contains Concerto Köln's vibrant accounts of the astonishingly precocious String Symphonies; Andreas Staier features with them in a final disc containing the early A minor concerto for piano and strings, and the D minor for violin, piano and strings, where Staier is joined by Rainer Kussmaul. Between ten and fifteen years old, these recordings are bracing in their freshness, giving as good account as one could hope for of works so teeming with ideas to make one marvel once more at the teenaged Mendelssohn's incredible facility. It's also reassuring to be shown some limits to the man's genius with his own slighly less brilliant watercolours used for each box's cover. Volume One is let down rather by the unnecessarily heterogeneous sources – in addition, the two overtures included are Berlin Philharmonic recordings under Keilberth from the 60s – but still makes a very decent collection. There are no such reservations for Volume Two. 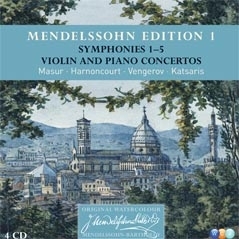 (WCJ Mendelssohn Edition Volume 1: 2564 69272-9; Volume 2: 2564 69270-9). Among the other rereleases – in the Maestro and Apex series – the core repertoire is well represented. As well as Harnoncourt's Mendelssohn, mentioned above (Symphonies 3 & 4; Maestro 2564 69367-4), we have a slice of his COE Beethoven ('Pastoral' Symphony, Leonore No.2, Coriolan, and Fidelio Overtures; Maestro 2564 69367-0) as well as him accompanying Schumann's Piano Concerto with an incandescent and magisterial Martha Argerich and the violin concerto with a strangely mannered and unusually unconvincing Gidon Kremer (Schumann Concertos; Maestro 2564 69368-5). 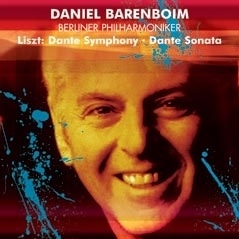 Another Teldec stalwart, Daniel Barenboim, is represented by a great disc of Liszt's works inspired by Dante: the 'Dante Sonata' and the 'Dante' Symphony. With the Berlin Philharmonic on fiery form the latter receives a thoroughly engrossing performance. In the sonata, Barenboim's playing is virtuosic and highly-charged, and he takes us clattering along with him on a thrilling quarter of an hour ride. He's at the helm, too, for a couple of discs with the Chicago Symphony Orhcestra: he leads efficient, very well played but slightly underpowered Strauss (Till Eulenspiegel and Ein Heldenleben: Maestro 2564 69368-7) and accompanies some old-school virtuoso performances of Mendelssohn's violin concerto and Brahms's Double Concerto (with Itzakh Perlman and Yo-Yo Ma; Maestro 2564 69366-8). Of a handful of two CD sets in the budget Apex line, four cover core repertoire – Beethoven, Brahms, Schubert and Mahler – but perhaps the most interesting is a set of Debussy Transciptions 'for piano duet or piano four hands'. Jean-François Heisser and Georges Pludermacher join forces for arrangements by André Caplet of La Mer and Images and Ravel of Nocturnes on disc one, while disc two includes some fascinating transcriptions by Debussy himself of repertoire ranging from three numbers from Swan Lake, to a hugely enjoyable version of Saint-Saëns' Introduction et Rondo Capriccioso and Wagner's Flying Dutchman overture. (Apex 2546 69209-8). There are more piano duets, this time by Schubert, played by Anne Queffélec and Imogen Cooper on another, highly recommendable set. Including a tender and moving account of the great F minor Fantasie and a well paced 'Grand Duo', as well a generous selection of smaller works, this well-filled set represents a great value introduction to a part of Schubert's output that's still somewhat underrated. (Apex 2564 69212-9). Kurt Sanderling's low tension Erato Mahler Nine, recorded with the Philharmonia from 1992, is probably still going to struggle to assert itself in a busy field, even at a new, low price. (Apex 2564 69229-9). The Trio Fontanay's Brahms, however, makes a rather more appealing prospect, containing some satisfyingly big-boned and virtuosic playing from the German ensemble. (2564 69229-9). Similarly, János Starker's set of the Beethoven cello sonatas – recording in the late 70s with Rudolf Buchbinder – presents some pleasingly robust musicianship and, including the three sets of variations, a good-value coupling. (Apex 2564 69223-7).